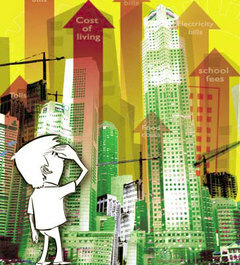 mrbrown.com: TODAY: S'poreans are fed, up with progress! S'poreans are fed, up with progress! You walk into your new lift on the first floor, and the scanner reads the contactless cashcard chip embedded in your forehead. This chip would be part of the recently-announced Intelligent Nation 2015 plan, you know, that initiative to make us a smart nation? The door of the lift won't close, the bus won't stop for you, taxis will automatically display "On Call" when their chip scanners detect you're broke. I also found out recently that my first-born daughter's special school fees were going up. This is because of this thing called "Means Testing", where they test your means, then if you are not poor enough, you lose some or all of the subsidy you've been getting for your special child's therapy. I think I am looking at about a $100 increase, which is a more than a 100 per cent increase, but who's counting, right? We can afford it, but we do know many families who cannot, even those that are making more money than we are, on paper. But don't worry. Most of you don't have this problem. Your normal kids can go to regular school for very low fees, and I am sure they will not introduce means testing for your cases. mr brown is the accidental author of a popular website that has been documenting the dysfunctional side of Singapore life since 1997. He enjoys having yet another cashcard, in addition to his un-contactless one and the ez-link one to add to his wallet.